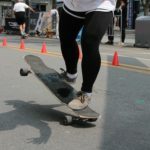 Dasol from Suwon and Minju from Hwaseong in South Korea ripped last weekend they a downhill spot in Yeoju, South Korea. They are good friends and also top class girl downhill riders in Korea. Filmed by Minju’s husband Daejin. Yuna as the trick machine from Daejeon in South Korea and rides for Dasilva Boards, Victors Boardshop, Powertector and Lakai Korea.